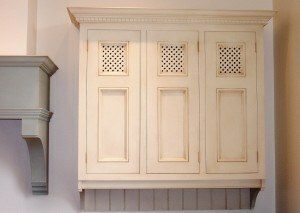 If you fancy something a little different to a plain colour then another popular finish I do is ‘antiquing‘. 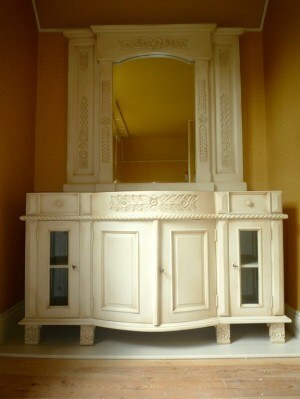 This works really well in country or period homes. Antiquing is a term that essentially means creating a specialist paint finish that makes things look slightly aged and patinated. It’s more subtle than a distressed finish (sanded back areas) and can be a great solution where plain colour might look too modern or stark. 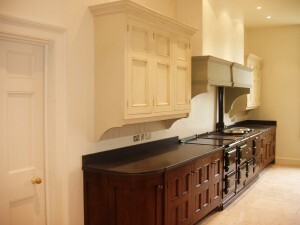 This particular kitchen was painted in an stunning old house that was being updated and re-developed in Sharrow, North Yorkshire. The kitchen had already been primed by the manufacturers but as always, the first step was a thorough clean with sugar soap. I then masked off all the key areas, lightly sanded the primer and filled a few areas that needed attention after the fitting. For the top coat I applied two-three coats of Farrow & Ball’s ‘New White’ eggshell paint. This gave me the perfect non porous base I needed to then create the ‘antique’ effect. 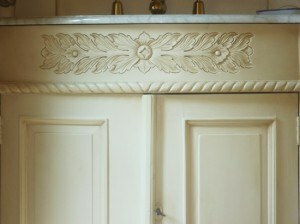 It’s essential for this kind of finish (as with many paint effects) that the base is perfectly covered and non porous so that the glaze can easily glide over the top coat and not get sucked into it. The effect itself was created by applying a tinted oil glaze with a brush, stippling it out and then using a lint free cloth to get the finish I wanted. The glaze was good old Ratcliffes oil glaze (now sadly no longer around) that had been tinted with raw umber and burnt umber artists tube oil paint. Once I was happy with the finish I sealed the effect in with two coats of matt Clearcoat varnish. The subtlety and depth that oil glazes allow you achieve make them perfect for this kind of effect and allow you complete control on how bold you want the antiquing effect to be. Naturally ‘antiquing‘ can also be done on furniture and again offers an effect that is subtle yet gives a definite, somewhat stylised, aged appearance. Over the years I’ve done many different types of furniture, from bedside cabinets to wardrobes, tailoring the exact colouring and intensity to suit the room’s decor. 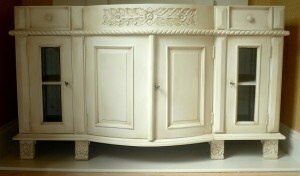 This antiqued washstand took pride of place in the stunning master en-suite at Oare Manor. The washstand had been bought from an auction house and was already painted, though in a colour that didn’t go with the room’s decor. The first stage was essentially then a re-paint, beginning with a good sugar soap clean, a light sand and some filling/caulking in certain areas. I then applied two coats of Farrow & Ball oil eggshell (before the new VOC regulations came about) which then gave me the perfect base for some light antiquing. 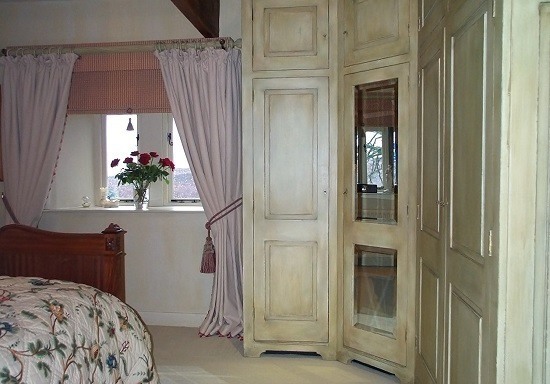 The antique effect itself was kept very subtle as there was a lot going on with other elements of the room. Essentially a tinted oil glaze was applied (in the same way as on the kitchen above) to create not only an aged look but to enhance the carved detailing, giving it depth and making it into even more of a feature. The new look washstand was then painted with water resistant Clearcoat acrylic varnish to add durability to the finish. As I mentioned before, the colours used and the intensity of the antiquing effect can be exactly tailored to the client’s preference. 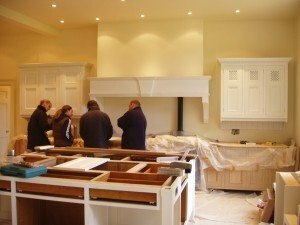 For this particular project the required finish was something much more obvious, with several colours building up to give oodles of depth. 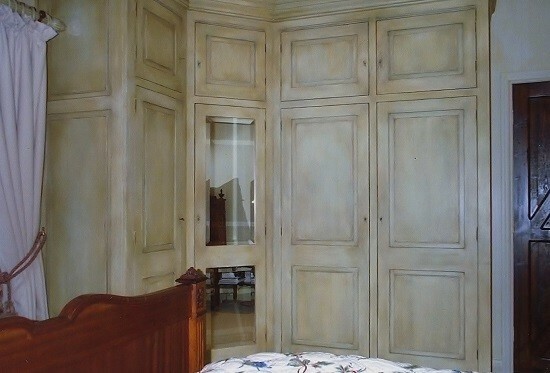 These wardrobes were originally plain tulip wood so the first preparation stage was priming them with a Zinsser 1-2-3 water based primer. After priming, I filled various areas and then lightly sanded everything to get a perfectly smooth finish. Once primed and sanded I began the top coat – three coats of F&B’s Cooking Apple Green eggshell. Once a block colour had been achieved it was time to start the first of many layers of tinted glazes to get the heavily antiqued effect. The only real way to create such depth and complexity of colour is to apply a multitude of tinted glazes, steadily getting darker and darker. This finish was created by applying 5 separate layers of glaze starting with terre verte artists oil paint and finishing with raw umber/paynes grey pigment. 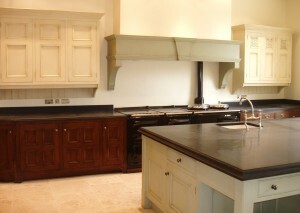 The effect was then sealed and made entirely durable with a Dulux’s Clearcoat matt varnish.